Reading and share top 159 famous quotes and sayings about Retirement by famous authors and people. 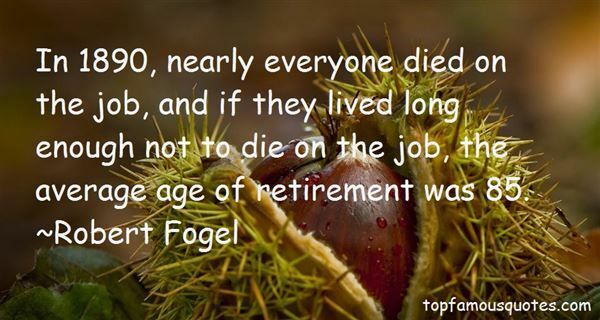 Browse top 159 famous quotes and sayings about Retirement by most favorite authors. 1. "She also considered very seriously what she would look like in a little cottage in the middle of the forest, dressed in a melancholy gray and holding communion only with the birds and trees; a life of retirement away from the vain world; a life into which no man came. It had its attractions, but she decided that gray did not suit her." 2. "Money isn't everything, but it is when you start thinking about putting money away for your retirement days." 3. "Often stereotypically sandwiched between empty nest syndrome and retirement, rhinoplasty is actually a fluid phase that can occur before, after, or concurrently with any other life stage." 4. "Personal savings accounts to me are one of the most powerful things, not necessarily in saving, solvency, or bankruptcy of the program, but in guaranteeing, the words I used a few minutes ago, a safe and secure retirement for our seniors." 5. "I think if we are actually going to accept our generation's responsibility, that's going to mean that we give our children no less retirement security than we inherited from our parents." 6. "I will work with my colleagues on both sides of the aisle to preserve the Social Security promise that provides secure retirement benefits for all, especially those who are most at risk such as widows, orphans, and people with disabilities when the need arises." 7. "As we get closer to the end of this Congress, we should be addressing the urgent needs of the American people - the war in Iraq, affordable health care, a sensible energy policy, quality education for our children, retirement security, and a sound and fair fiscal policy." 8. "I enjoyed retirement the right way... linguine con vongole, red wine and plenty of truffle cheese." 9. "I bless God for this retirement: I never was more thankful for any thing than I have been of late for the necessity I am under of self-denial in many respects." 10. "The rolling contract was designed to specifically take away some of that retirement talk and retirement issue." 11. "But I'm really enjoying my retirement. I get to sleep in every day. I do crossword puzzles and eat cake." 12. "I found out retirement means playing golf, or I don't know what the hell it means. But to me, retirement means doing what you have fun doing." 13. "Preparation for old age should begin not later than one's teens. A life which is empty of purpose until 65 will not suddenly become filled on retirement." 14. "Dream BiggerYou think. Stop letting small minded peopledictate your futurewhen allthey really want is foryou to accomplishthe work of two, for minimumwage. Reach higher, orelseplan for retirementin a cardboard box, prayingglobal warming is morethan a catchphrase.And if thatfailsto be the case,hope freezing to deathis really as simpleas falling asleep,to the lullaby of teeth chatter.Dream biggerbefore you can't rememberhow to dream at all." 15. "Who knows whether in retirement I shall be tempted to the last infirmity of mundane minds, which is to write a book." 16. "I don't even think about a retirement program because I'm working for the Lord, for the Almighty. And even thought the Lord's pay isn't very high, his retirement program is, you might say, out of this world." 17. "On issues carrying as much emotional freight as race - and there aren't many - a U.S. senator needs to speak with care and consistency. Otherwise, he could find people speaking at his own retirement tribute." 18. "And if he did not always like what he had to do...he never forgot what the alternative would have been. Not only in Argentina, leading the unhappy existence of a refugee, but also in the courtroom in Jerusalem, with his life as good as forfeited, he might have still preferred—if anybody had asked him—to be hanged as Obersturmbannführer a.D. (in retirement) rather than living out his life quietly and normally as a traveling salesman for the Vacuum Oil Company." 19. "As a musician, life is not over just because you are getting older, and so I find retirement a very frightening and dark thought." 20. "Old age is not a limitation or that your time have expired. Retirement is not that you are tired.You have more experience"
21. "Look, we're trying to explore other options to your retirement," the whitecoat said. "You might be useful to us in other ways. "Because we're not that useful dead,"Nudge said thoughtfully.No," I agreed. "Well, maybe as doorstops. "The whitecat made an "eew" expression.Or those things in a parking lot that show where the cars should stop," suggested Iggy. He closed his eyes and went stiff, to demonstrate what it would look like. Also an option." 22. "Not to brag, but I was instrumental to the success of the instrumental version of the popular retirement home song, "Grandma Got Herpes—For A Discount"." 23. "Hope. An emotion that always kept suckering me in, time after time, despite my supposed retirement from the assassin business. Hope. The one thing that always seemed to get me into more trouble than just killing people for money ever had. Ah, hope. Sometimes, I really hated it." 24. 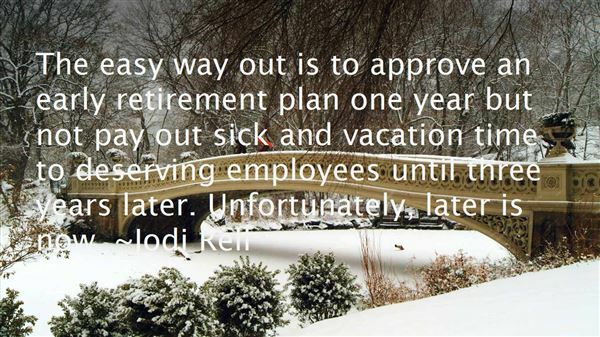 "The easy way out is to approve an early retirement plan one year but not pay out sick and vacation time to deserving employees until three years later. Unfortunately, later is now." 25. "The pain of retirement means loss." 26. "Germany, I think, was first to substitute a Social Security program for its elderly based on this premise, that is, that we would tax workers to pay retirement benefits for those retired." 27. "...first the strangers came with argument and authority and gunpowder to back up both. And in the four hundred years Kino's people had learned only one defense - a slight slitting of the eyes and a slight tightening of the lips and a retirement. Nothing could break down this wall, and they could remain whole within the wall." 28. "There was no singles problem until singles got so single-minded that they stopped wasting time with anyone ineligible. Before that, it was understood that one of society's main tasks was matchmaking. People with lifelong friendships and ties to local nonprofessional organizations did not have to fear that isolation would accompany retirement, old age, or losing a spouse. Overburdened householders could count on the assistance not only of their own extended families, but of the American tradition of neighborliness." 29. "Right now, too many women who reach retirement age find themselves widowed or single, relying on their Social Security check for over half of their income." 30. "We've got to make sure our younger workers understand that as life expectancy increases, the retirement date for benefits increases also." 31. "Well, we certainly need to raise the retirement age. I've told my 19-year-old and my 22-year-old that they're not going to be getting retirement benefits at age 62." 32. "Retirement isn't so bad. Give me a tall drink, a plush sofa and a rerun of 'Matlock,' and you can have the rest. Matlock is my hero. He never loses." 33. "We sought justice because equal pay for equal work is an American value. That fight took me ten years. It took me all the way to the Supreme Court. And, in a 5-4 decision, they stood on the side of those who shortchanged my pay, my overtime, and my retirement just because I am a woman." 34. "IRAs are intended for retirement." 35. "Starting a new retirement plan for those below a certain age is something tens of millions of Americans have already been through at work." 36. "A woman who can eat a real bruschetta is a woman you can love and who can love you. Someone who pushes the thing away because it's messy is never going to cackle at you toothlessly across the living room of your retirement cottage or drag you back from your sixth heart attack by sheer furious affection. Never happen. You need a woman who isn't afraid of a faceful of olive oil for that." 37. "I only work every couple of years. I go into retirement between films." 38. "Unlike every other retirement vehicle, such as IRAs and 401(k)s, you receive a tax deduction for making contributions to your HSA but don't have to pay income taxes on withdrawals." 39. "We go to school so that when we grow up we can make lots of money, and we make lots of money so we can provide for our children, and we have children to provide for our retirement (because we don't have any money left)." 40. "Since her retirement from teaching Miss Beryl's health had in many respects greatly improved, despite her advancing years. An eighth-grade classroom was an excellent place to snag whatever was in the air in the way of illness. Also depression, which, Miss Beryl believed, in conjunction with guilt, opened the door to illness. Miss Beryl didn't know any teachers who weren't habitually guilty and depressed--guilty they hadn't accomplished more with their students, depressed that very little more was possible." 41. "In 1890, nearly everyone died on the job, and if they lived long enough not to die on the job, the average age of retirement was 85." 42. "Contemplation of life after retirement and life after death can help you deal with contemporary challenges." 43. "Today more people believe in UFOs than believe that Social Security will take care of their retirement." 44. "Sorry, but retirement offends me. You don't just stop fighting in the middle of a war because your legs hurt. So why do you get to stop working in the middle of your life just because your prostate hurts? That's desertion." 45. "Pension reforms, like investment advice and automatic enrollment, will strengthen the ability of Americans to save and invest for retirement." 46. "The President and I agree that Social Security needs to be preserved so that we can ensure that all Americans receive the retirement benefits they've been promised. But we disagree as to how best to fix the system." 47. "For these reasons, women tend to rely more heavily on Social Security in their retirement than do men." 48. "I believe that social security should be a universal retirement guarantee and not means tested." 49. 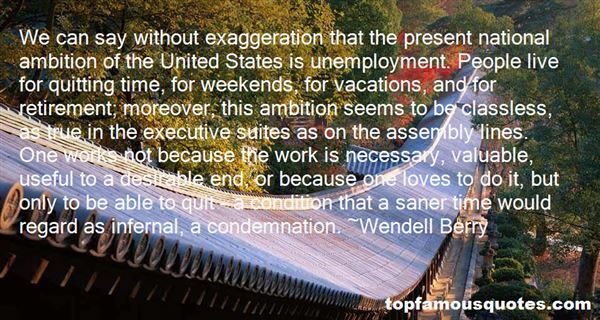 "We can say without exaggeration that the present national ambition of the United States is unemployment. People live for quitting time, for weekends, for vacations, and for retirement; moreover, this ambition seems to be classless, as true in the executive suites as on the assembly lines. One works not because the work is necessary, valuable, useful to a desirable end, or because one loves to do it, but only to be able to quit - a condition that a saner time would regard as infernal, a condemnation." 50. "And I am in retirement from love." She has to live, Eliott. I owe her a lifetime of apologies. ""Sometimes I think that's all we owe our parents." Who Was Talking About "Retirement"?